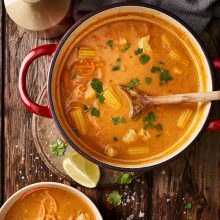 Nothing hits the spot on a cold day like a warm bowl of soup – comforting and crammed with good things to keep you going. And the good news is that, if you make it yourself from fresh ingredients, it’s a really top way to get your five-a-day as well as the fibre you need to keep your body working at its best. It’s also a great way to use up leftovers and both tastier and cheaper than picking a tin off the shelf. Smooth or chunky, hot or cold, spicy or creamy, chicken, fish or vegetable – the choice is yours. Tip: Cheese twists make a delicious accompaniment. And: Any remaining pesto can be kept in the fridge for up to 2 weeks – store in an airtight container and cover the surface with a little olive oil. We made this in a slow cooker, but it could also be made in a large pan. 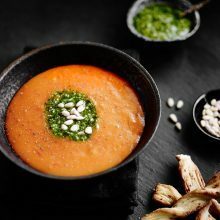 Let us introduce our soup making superhero – no pan, no hob, no hassle! Fresh soups of all varieties are now easier than ever to make – Lakeland’s fantastic Touchscreen Soup Maker can do the whole job – sautéing, simmering, stirring and blending – from start to finish. And if you fancy something more refreshing, all your favourite juices, smoothies, purées and sauces are also just a few taps away. So there’s no need to stop when the warmer weather comes along. This is one kitchen superhero you won’t want to be without. Simply add your ingredients, select one of the 4 pre-programmed functions and 30 minutes later you can be tucking into tasty, freshly-made soup. 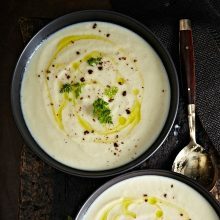 There are automatic settings for rustically chunky or smooth and creamy soup and, if you want to make your own recipes, the temperature can be set from 75 to 100°C and the timer up to 60 minutes, and three blend speeds – low, medium or high – let you get it exactly the way you want it. And it’s really easy to use, too: just make your selection on the touchscreen LED control panel. There’s a countdown timer to let you know when your soup is going to be ready and it beeps when stirring, when cooking is finished and it’s keeping warm. It also does much more than make soup. 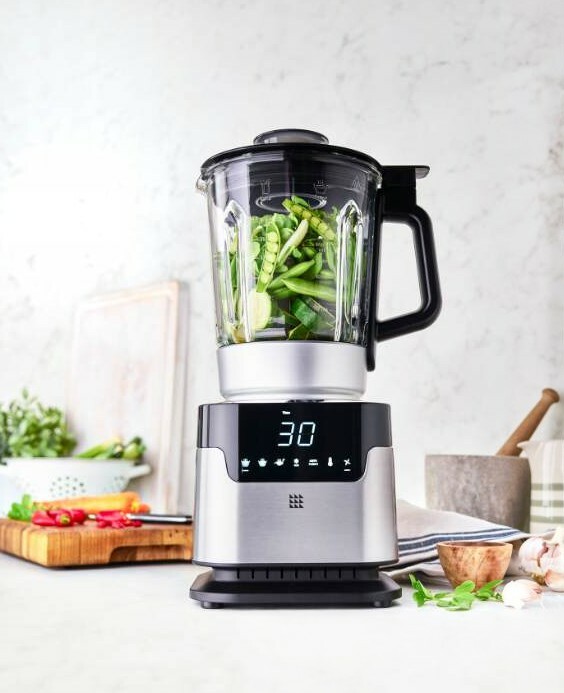 One of the other automatic settings let you cook and blend sauces in as little as 20 minutes, and the ice setting blends without heating to create nutritious smoothies, milkshakes, baby food and cold dips and sauces. Quick and easy to clean thanks to its auto-clean setting and non stick heating plate, it comes with a cleaning brush so you can reach right underneath the stainless steel blade. The heavy duty, durable glass jug makes it easy to check your ingredients while cooking and because it blends in short, gentle bursts of slow stirring it’s easy to achieve whatever consistency you like. You can add extra ingredients during cooking using the removable measuring cup in the lid and it comes with a selection of recipes to help you get started. Find out more about the Lakeland Touchscreen Soup Maker here. A ‘souper’ idea for lunch at the office! Big enough to hold a generous helping, this made-for-the-job mug has a tight-seal, clip-on lid. Just click open the steam vent to heat the contents in the microwave then eat straight from the mug – the rounded base makes it really easy to spoon up every tasty drop. It’s even freezer safe for ready-to-go, lunch-sized portions, and is also great for stews, noodles, pasta, beans, hot drinks and more. Made from Phthalate and BPA-free polypropylene, and making it easier than ever to enjoy your favourite home-cooked meals on the go, this soup mug helps ensure your lunch break is something to look forward to. Find out more about the Sistema® Klip It Soup Mugs here. Used by many celebrity chefs these incredibly flavourful stocks give a truly authentic, intense taste. Created using the finest ingredients available, each little pot of powder makes 6-8 litres of rich stock, and the amazing aromas when open the pots will convince you of their pedigree. We really can’t recommend them highly enough – at testing time, we couldn’t resist sipping spoonfuls of the stock like it was soup – they’ll bring a world of depth and balance to your soups, sauces, casseroles, risottos and more. Find out more about Essential Cuisine Stocks here. Come home to a slow-cooked meal...Mothering Sunday, or Mother’s Day?